The art world changes daily. Audiences want to stay up to date. As New England’s premier culture magazine, now in its 13th year, Artscope brings audiences the reviews and news they want. The goal of Artscope is to take art to the public and to provide our readers with an understanding of the process, approach and inspiration of local as well as international artists exhibiting throughout the Northeast. Emphasizing an important exchange of information, Artscope provides current coverage streamed through seamlessly integrated media channels, and focuses on the people and events that shape the culture in New England and beyond. Artscope believes in being approachable, inclusive and relevant, with content that brings to the forefront an understanding of the arts as it reflects artists’ work. It creates an active audience of collectors, artists, and enthusiasts who participate and interact across a wide landscape. We strive to make art an accessible medium by which its readers can develop a comprehensive and interactive appreciation of the arts. Artscope covers artists, galleries and museums in the New England region, enthusiastically encouraging its readers to understand the work exhibited and to actively participate in the region’s arts community. Aiming to inform and entertain with a consistent standard for high quality content and production, Artscope works to increase the visibility of artists from New England and beyond in hopes of expanding the arts community and its marketability, sales potential and visitor numbers. Our committed editorial team and talented group of writers, photographers, arts associates and graphic and web designers have set the bar high for Artscope to serve its readers, advertisers and the arts community at large through performance and aesthetics. 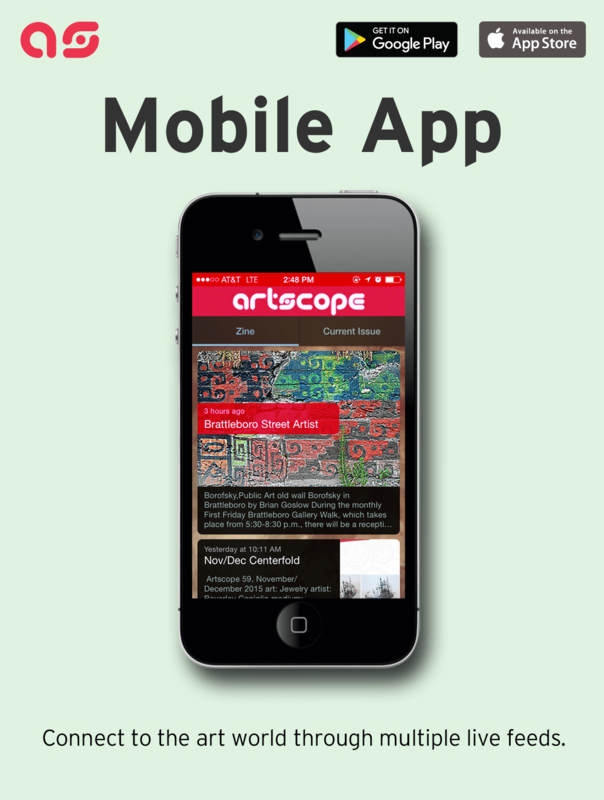 Today, Artscope is the premier culture magazine of New England. Although we have grown considerably since our founding, we remain committed to our original mission to provide our readers with high-quality content and to connect local artists and institutions with an active audience. We also continue to hold ourselves to high standards of journalistic excellence. Copies of the issue are available at hundreds of museum, gallery, college, university and educational locations throughout New England. For the location nearest you, visit the AS Hot List or email info@artscopemagazine.com. The tablet is available anytime, anywhere worldwide at your fingertips on iPad or iPhone Newsstand. Scope us out in the bimonthly physical issue, bimonthly iPad tablet edition, biweekly eblast, weekly Artscope Online articles and mobile app!